When planning a road trip around Iceland’s Ring Road, you need to know how long your journey is going to take. It’s a good idea to know how long it takes to get from one attraction to another so you can plot your itinerary. 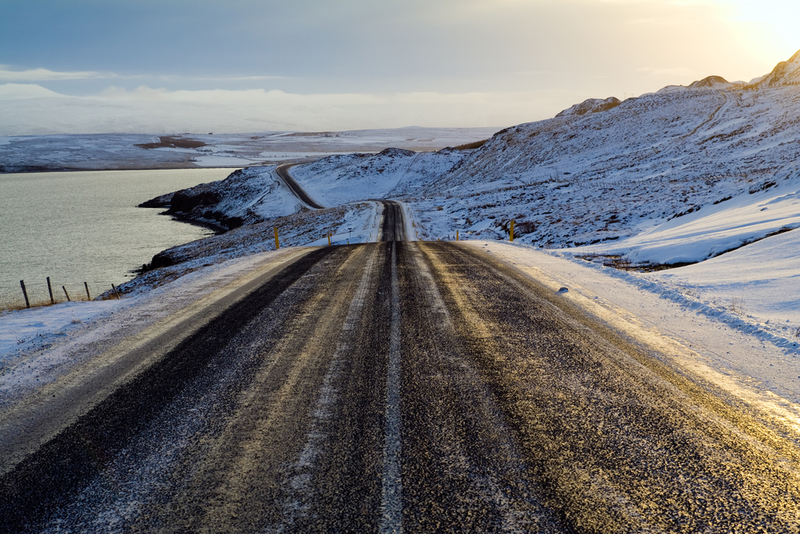 If you’re driving in Iceland and spending five to ten days exploring the island (the average length of time of most people’s trip), then it’s likely that you won’t be on the road for more than a few hours at a time. Iceland is compact enough that getting from point A to point B does not require massive driving marathons. So how long does it take to drive around Iceland? And what about driving in inclement weather? You’ll want to give yourself extra time if road conditions or the weather are bad. Let’s take a look at driving in Iceland and the distance around Iceland’s Ring Road. How Long is Iceland’s Ring Road? Iceland is a small island the size of Kentucky or approximately half the size of the UK. Because it’s shaped roughly like an oval, it’s quite easy to drive around the island. There is a road called the Ring Road (Route 1) which, you guessed it, circumnavigates the island. This makes things quite easy for travelers and Icelanders alike, as the country’s main towns and natural attractions are located along this route. Iceland’s Ring Road measures 828 miles (1,332 km) in length. This distance is spread out over towns, fishing villages, fjords, and gorgeous glacier-filled landscapes. The road consists of a simple two-lane highway with traffic flowing in both directions. You’ll find some single-lane bridges and a few areas with unpaved gravel. So while some might think that to calculate how long it takes to drive around Iceland’s Ring Road you simply divide the distance by the maximum speed limit, it’s not that straightforward. There are many times when you’ll be slowing down, whether it’s for sheep on the road or inclement weather. One thing you definitely don’t want to do is speed. There are speed cameras everywhere and when they catch you, you’ll be subject to heavy fines by the Icelandic road authorities. Not exactly the best souvenir to bring home from Iceland. Of course, no one comes to Iceland to spend day and night driving around the Ring Road in a race to get back to Reykjavik in under 24 hours. Life is a journey rather than a destination, and the same thing can be said about Iceland. You’ll be making plenty of stops to take pictures and detours to hike glaciers and waterfalls, swim in hot pots, and just enjoying the country in general. This is in addition to obligatory stops to rest, refill your fuel tank at a gas station, shop for groceries and snacks, eat your meals, etc. What most people are really asking when inquiring about how long it takes to drive around the island is how long they should spend in Iceland. If you have the luxury of a long vacation, I would recommend spending 10-14 exploring our Nordic island. That affords you plenty of time to see the country’s highlights at your own pace. For those more pressed for time, a 7-day itinerary is enough to drive around the whole island, even though you won’t get to explore in depth as much. And five days in Iceland is the minimum that I would suggest. So the short answer is: it takes less than 24 hours to drive around Iceland. But it’s much more enjoyable if you opt for a 7-day or 10-day Iceland itinerary. It’s possible to drive around Iceland’s Ring Road in five days, but I don’t recommend it as you will feel quite rushed and will not have much time to see everything. If you’ve only got five days in Iceland, I recommend focusing on one zone. The South Coast of Iceland or the Diamond Circle in northeast Iceland are perfect for such short trips. However long it takes you to drive around Iceland in your rental car, just remember to soak up every moment. You’re on the trip of a lifetime and want to remember every sweet memory.